You’ve picked colours for the walls, skirting boards and some items of furniture. You have worked hard to create a perfect colour scheme. So why stop when it comes to the pictures on the wall? They are important details in your design scheme. Emphasise the details with custom-made frames, hand finished in your choice of colour. Dulux, Farrow & Ball, Little Greene, Paint Library, Sanderson, Zoffany, Mylands, Earthborn. Let us know the name of the colour, either from a colour chart or the manufacturer’s website. An effective framing idea is to match a colour from the artwork. No problem, let us know and we can help identify it and mix a sympathetic paint. Want to match a Pantone reference or hexadecimal code – wing it over! If you find it difficult to imagine, don’t worry. Using our state of the art software you can create a perfect mock-up of the finished framed picture. Custom Frame or Print and Frame? Do you have a picture that you want to hang and need the right frame in the right colour? A favourite photo that you can upload for us to print and frame in a beautiful custom coloured frame? When you’re ready: for custom made frames start here, and for Print and Frame start here. But read a little more first….. The frames in our ACUTS (Any Colour Under The Sun) range are all made from FSC Certified Tulip wood. We guarantee that the timber from Pennsylvania in the USA is responsibly sourced. We make the frame in plain unfinished timber. The corner joints use our tested stronger “dovetail” jointing system. We then sand the frame to a silky smooth finish before it goes on to finishing. One of our experienced craftspeople will apply your chosen finish in our spray booth. Using spray equipment we apply three coats of Emulsion Paint in the required colour. Each coat dries before sanding. The process establishes a solid, even colour base before we apply two further coats. This time we apply Satin Sheen water-borne Lacquer. The result is a frame with quality and feel of a very expensive gessoed hand-made frame. The corner joints are seamless. Our technique is more common in the furniture industry than in picture framing. So, these frames are completely affordable. To reiterate: your starting point depends on what you wish to frame. Do you already have a picture that you need a frame for? Or do you have a favourite photo that you want us to print and frame?
. For custom made frames start here, and for Print and Frame start here. 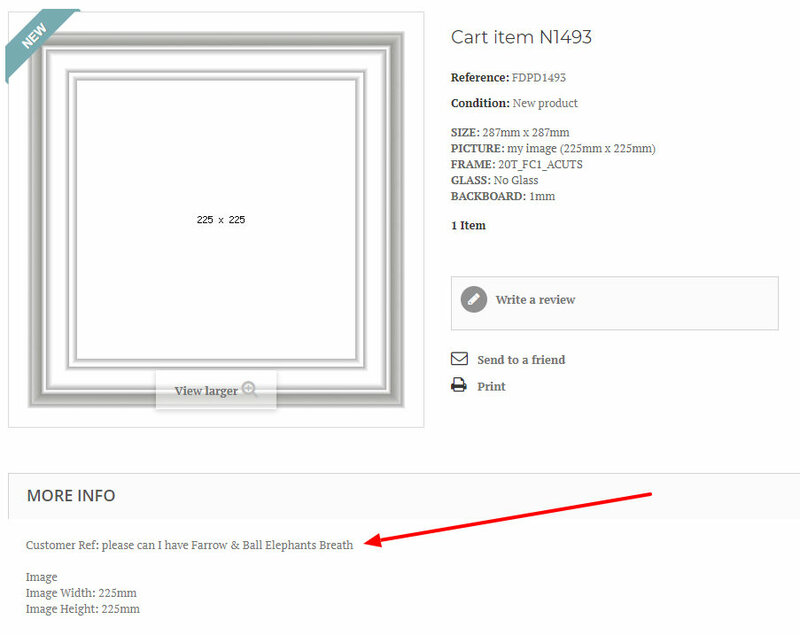 Go to the frame visualiser page and enter all your sizes. At the bottom of the second column you will see a box labelled “Code”; enter into this box “ACUTS”. Click on the white space to the right of the column. The selection of frames should now refresh as per the diagram below. So, yes they’re all grey – Farrow and Ball LampRoom Grey in fact. But the price of these frames includes finishing in any custom colour. 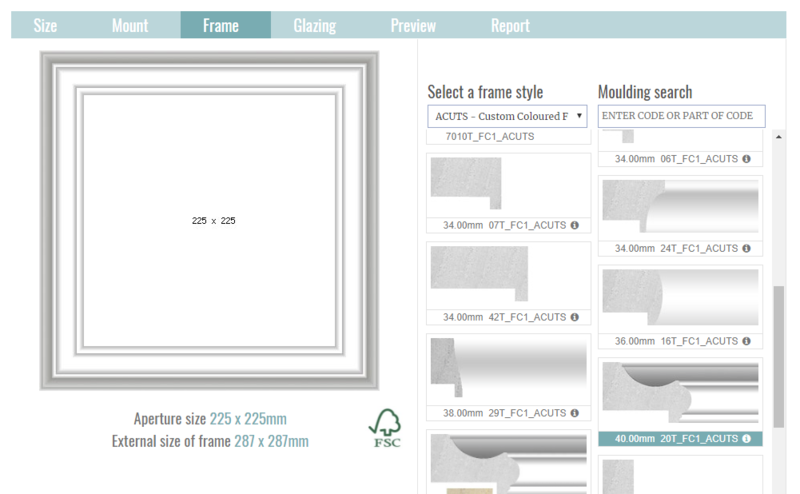 When you are happy with your choice of frame profile, sizes, mount and glazing choices etc, click on add to basket. If you want to order more than one frame or picture then set them up, add them to the basket until you’re ready to check out. Log in or register and choose your delivery address. You will note underneath the address there is a section where you may add a comment. Please put the full reference of your paint colour in this box for every ACUTS item as per the diagram below. After submitting delivery details go to checkout. You will see a list of your cart items. Click on the picture of the required frame to check that your notes are correct. 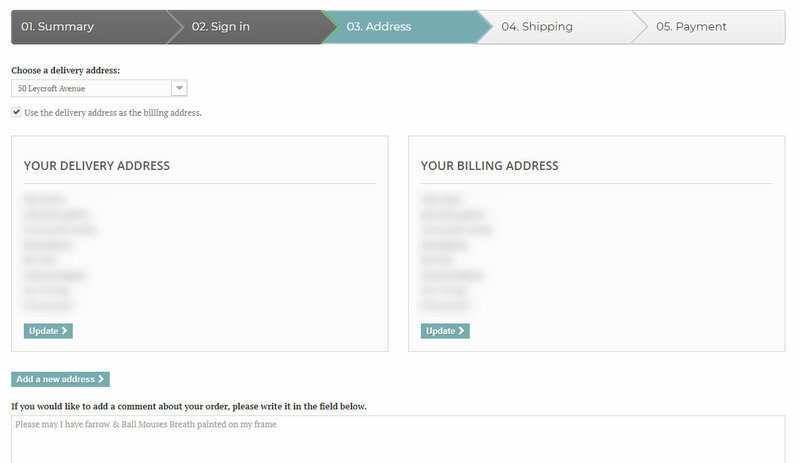 When you confirm your order, you’ll get an emailed confirmation. This shows all the detail of each item on your order as shown below. Please check this and let us know immediately if anything is incorrect. In about ten days time we’ll let you know when our courier is going to deliver your custom colour frame.